Thanks so much for the prompt shipping and the handwritten note on the invoice was a tremendous personal touch as well. The product EXCEEDED my expectations! I had a side business through high school and after college for almost 10 years doing automotive detailing and car stereos and this 3 stage kit is by far the best, highest quality product I have come across. The Gel Coat full kit literally came with everything but a buffer. I cannot thank you enough for helping me to bring our 18 year old Malibu from “chimp to pimp” with a little elbow grease. I have included before and after pictures, perhaps for you customer gallery or websites or just your general viewing pleasure? Either way thanks! Hula Boat Care, manufacturer of water conscious, boat detailing products has reached a milestone. Hula Boat Care is celebrating its 5th anniversary. Founded in 2011, Hula Boat Care has developed professional grade boat care products that provide effective results with minimal effort for enthusiasts and professionals alike. Each formulation is designed for the marine environment and reflects the relaxed, island lifestyle attitude boating enthusiast embrace. Innovative products have been the hallmark for Hula Boat Care. Gnarly Water Spot Remover features fruit acids to gently dissolve hard water spots without stripping sealant or wax intact on the surface. Surf Away Spray Detailer is a water-based, synthetic polymer formula designed to clean up all hard surfaces on a boat without streaking or smearing. Our gel coat compound, cleaner wax, polymer sealant and vinyl cleaner and conditioner are dock safe, easy to use and deliver professional results every time. The team at Hula Boat Care is continually working on developing cutting edge products that meet boaters’ needs as boats technology and the environment change. We are proud to announce that we will be launching four new products for 2017 to add to our line. We wanted to take a moment and thank everyone for taking part in Hula Boat Care’s success. Over the last 5 years we have made lots of friends who are as passionate about keeping boats shiny as we are. And, we are proud to know you all. We look forward to growing our circle of friends and we remain dedicated to supporting you all with our product line. In honor of our 5 year anniversary we are offering 5% off orders through September 30th. Thank you and we look forward to another 5 years!!!! 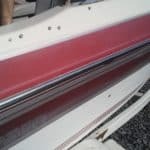 When you think of wiping down your boat after a day of fun on the water, most boaters are unclear why there are so many options available to them to “Wipe Down” their boat. We offer our customers two options because there is no one product that fits all needs. Surf Away Spray Detailer 11 is a water-based, synthetic polymer formula that is designed to clean up all hard surfaces on a boat without streaking or smearing. Surf Away Spray Detailer 11 allows the user to leave a “Just Waxed” look while removing light water spots especially in areas where the water does not have a high mineral content. I formulated it with a fruit punch smell, because that was my favorite drink growing up, and it makes using this product a fun experience. The polymers used in this product fortify the polymer coating created by Big Kahuna Polymer Sealant 14. Gnarly Water Spot Remover 9 has less synthetic polymer than Surf Away Spray Detailer 11 and instead it is filled with fruit acids to gently dissolve hard water spots while leaving any sealant or wax intact on the surface. Users should use this product sparingly, as it is concentrated, to avoid the surface becoming sticky especially in high heat and high humidity environments. Having fresh or even wet towels when wiping Gnarly Water Spot Remover 9 off will reduce chances of stickiness. Gnarly Water Spot 9 has a green apple scent, based loosely on my favorite hard candy.